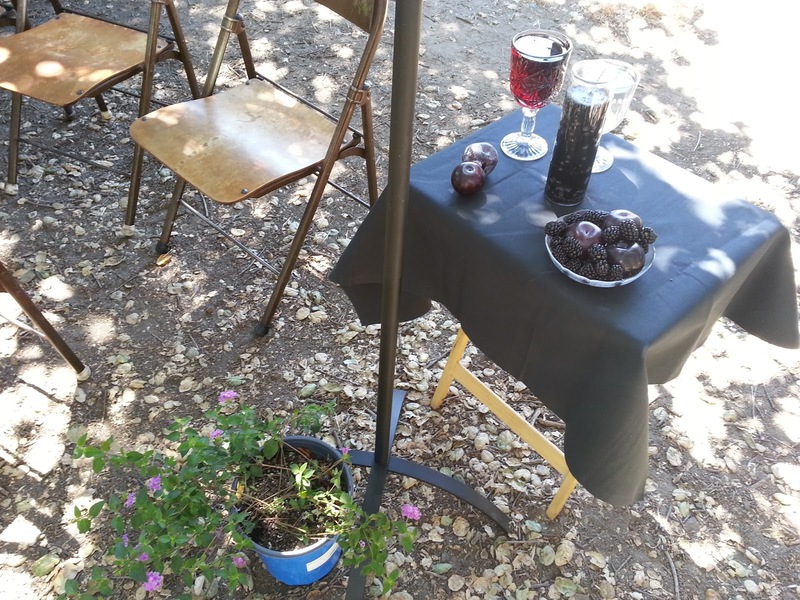 Previously I’ve talked about altars being a place for setting out tools to be used in a working or worship. 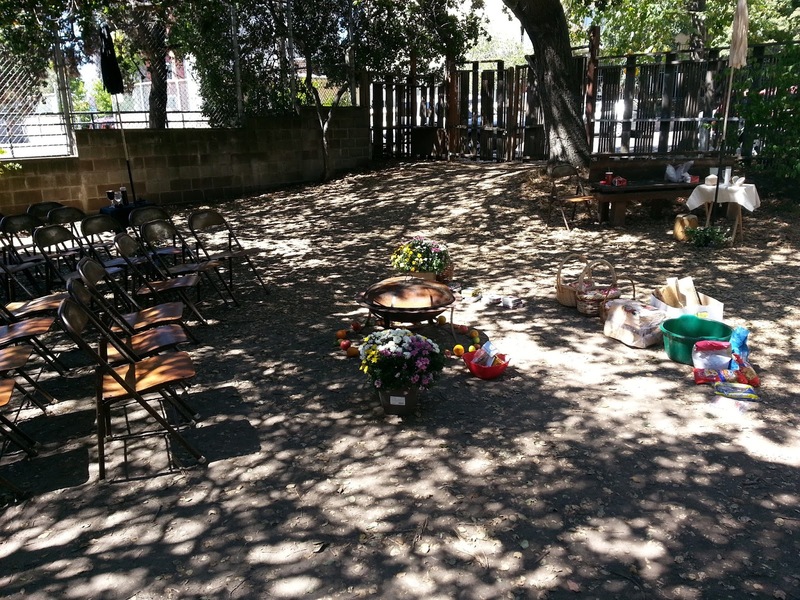 The altars set up by Rachael Watcher according to instructions of Mayan Elder Apolinario Chile Pixtún, affectionately known as “Tata,” were something else again. 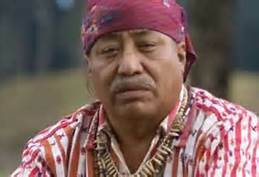 Tata, from Guatemala, is the Leader Coordinator of the Mayan Confederation of Guatemala, Belize, and Honduras. We are outdoors sitting in a circle under the shade of oaks, facing a roaring central fire. 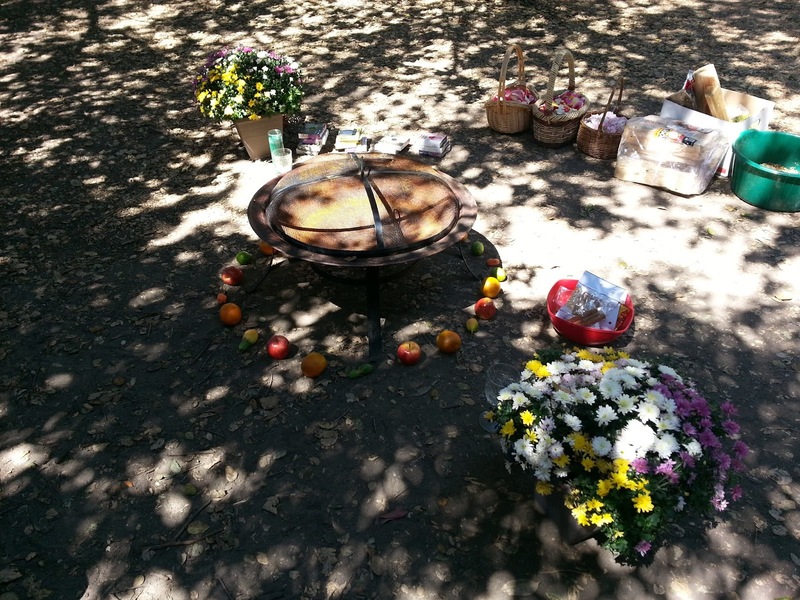 I take this to be the main working altar, since everything we did involved the fire. A row of greens alternating with apples, oranges and pears encircles the fire itself, which stands safely off the dry earth in a shallow fire bowl standing on three legs. Just beyond that circle stands an array of baskets, bowls, bottles, and bags containing materials to be used in the working. 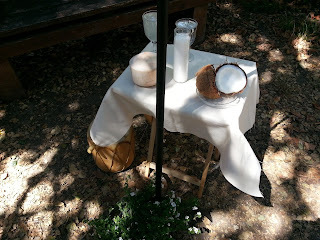 These included such things as a basket of flower petals; Florida water; a bag of wood chips; a bowl of mixed herbs, evergreens, crushed leaves and resins; and a basket of many small candles of all different colors. These are the working tools; none are on the altars. As we gather, someone goes around the circle distributing to each person a candle and a chunk of wood. Tata had explained, in Spanish through an interpreter, that his ancient Mayan religion honors the cardinal directions like Witches and many Pagans do. The quarters don’t necessarily carry all the many correspondences we use (East = Air, dawn, Spring, etc.). Nor are the colors assigned to each quarter those to which we’re generally accustomed. A tall dowel topped by something that looks like a big pompom stands in an iron base at each Quarter – one white, one red, one yellow, and one black. What appears to be a TV tray covered with a cloth of the corresponding color stands in front of each pole. A glass chalice of clear water sits on each table, along with a glass of juice and two pieces of fruit. The red altar, which is the one where Tata began the ceremony, held apples, pomegranates, raspberries, and red juice that looked like it may have been cranberry. In addition, potted flowers graced the base of the altar, beneath and just in front of the table. Again, the colors of the flowers reflected the colors each altar. 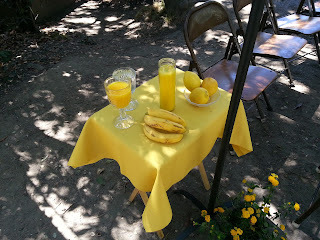 The yellow altar held a goblet of orange juice, some bananas and lemons, plus a sprinkle of greens as on the other altars. Beneath it stood yellow flowers. 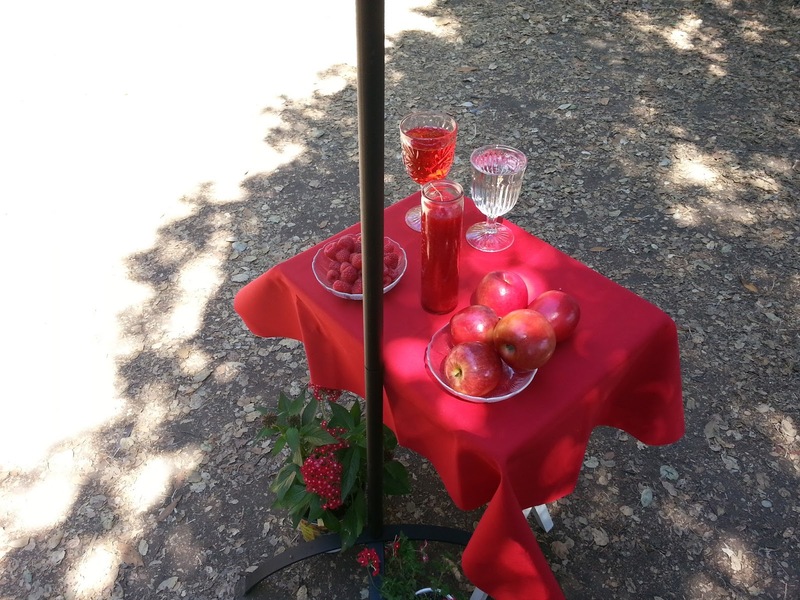 The black altar held a glass of the darkest juice, probably blackberry or blueberry. Its fruits were dark blackberries and plums. Dark purple flowers stood at the base. I can’t see the white altar well from where I sit, but its juice appears to be pale lemonade and it also holds what I think is a coconut, cut open to show its white meat, and a strange multi-sided geometrical looking white object. All the altars have been erected with great care. I later ask Rachael if she had created the altars or if she’d been instructed as to what objects were needed one each one and where. She made the altars according to Tata’s specifications. Glass novena candles in respective colors sit on each altar and are lit at the start of the ceremony. Perhaps had our ritual been performed in the dark, they would be more noticeable. Tata had explained that in his tradition they do what we would recognize as being Quarter-calling not in a circle, but rather cross-wise, beginning at the East and continuing to West, then from North to South. I am a bit disoriented, although it is obvious that the evening sun is setting in the West. Tata asks those of us who can to kneel facing each Quarter as he works. Those of us who can’t kneel simply stand with heads bowed, while the younger and fitter among us kneel. Tata speaks in his native tongue, so we hear no translation. Instead, we listen, as he’d told us to, with our hearts. He said our hearts could hear the words from his heart. He begins by kneeling before the red altar, which in my mind was associated with Fire and the South, but in this case was East. He speaks for quite a while as Quarter-calling goes, probably at least five minutes each, and with respect, solemnity, and fervor. Although I don’t know the language, I do recognize the words “Oakland, California” at each Quarter, and that’s where we are. He seems to be saying prayers to each direction. Next Tata addresses the black altar in the West in a similar manner, and then progresses to North and South. When we are thus centered in sacred space, the nexus of which was the fire, Tata instructs us to approach the fire from the East, offer a prayer, toss our candles and wood into the fire, and circumambulate deosil around the fire and back to our places. Doing this one person at a time takes a while, since there are about 40 participants. Sitting in the summer evening in a circle of colleagues who hold values similar to mine, watching each individual, gazing at the flames, feels good. The quiet and the “between-the-world-ness” brings serenity. At my turn at the fire, I ask for forgiveness for using more than my share of the Earth’s bounty, and I pray that all beings have enough of everything they need, that we learn to take nor more than what we need, that we tread lightly on the Earth and live in balance. I whisper words to this effect with the breath of my words upon the wood and the candle, and then I add them to the flames. Later more baskets and bags are passed around for us to take more candles, wood chips, herbal mixtures, flower petals, as we take our concluding walk around the circle and up to the fire. Towards the end of the ceremony, Tata mixes a bowl of what appears to be mainly waters. In the process of mixing the waters from different bottles, he blows across the mouths of the bottles to produce a sound. I do not know why, but I do know that this act carries meaning. He sloshes the water around the perimeter of the fire, where the circle of fruits and greens separates the fire from the larger circle. I seem to remember that he also sprinkles each Quarter altar with the water. There is no formal dismissal of Quarters as is customary in Witchen circle. Above I’ve recounted my experiences and impressions. I’m sure that each person there carries slightly different memories, depending upon many variables, including such things as the mood they were in that day, the experiences they brought with them from their own lives, any expectations they may have had, and where they sat. What appealed to me was the obvious care and reverence with which everything was brought together and performed, the sense of fellowship I felt, the beauty of the surroundings, both natural and human-made, the quiet filled with actions but not with talking, and the flames. I’m grateful to have had this opportunity. Post-mortem: More about the purpose of the ritual. As I mentioned earlier, Tata talked about “the current time of B’AQTUN and the spiritual energies of the Mayan pyramids: How we can and must dive deeper into the ceremonies, the energies, and the powers that need to be managed at this time.” Perhaps it should have been obvious that this talk concerned the Mayan calendar and the progression of the ages, but it wasn’t to me or to my two companions. I tend to tune out when I hear people talking about predictions of end times. I hold a vague acceptance of the notion of the Age of Aquarius. The Kali Yuga appeals to me. So call me ignorant: I knew nothing of the Mayan calendar or any predictions, only that they were a current topic in the news and in conversation. However, I have since learned that the Mayan calendar delineates a 5,200-year cycle. We are at a time that is the ending of one time and the beginning of the next lifetime of the world. This is a time of significant rebirth. We “People of the Earth” can mediate in this time of transition from one age to the next. We can facilitate the change. Tata was addressing the spirits of place when he prayed at each cardinal point. At first he encountered puzzlement on the part of the local lands spirits when he spoke his native language, so he also addressed them in Spanish. Tata acknowledged with pleasure the presence of so many women at this working. Both he and the spirits of place were glad for our participation. Knowing as I now do more of the specific intent of this working, I can say that my prayers and offerings wouldn’t have differed from the ones I used. I later learn that this is white cranberry juice with a splash of coconut water. It was white cranberry juice with a splash of coconut water.